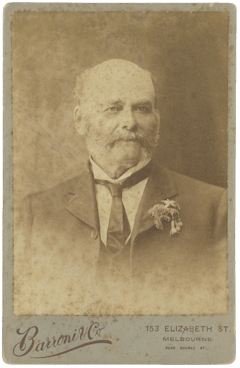 Richard Ramsay Armstrong was born in Jersey in 1833, the son of Francis Wheeler Armstrong, an army officer who served throughout the Peninsular War. 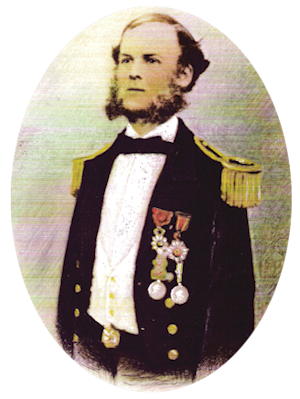 Sent away to join the Navy at thirteen, by the time of the Crimean War he was a veteran of six years service: three in the Mediterranean and a very tough and character-forming three on the West Coast of Africa suppressing the slave trade. In the Black Sea during the war he served under Richard Ashmore Powell in Vesuvius and the notorious Admiral Boxer in Balaklava harbour. He then did six months ashore with the Naval Brigade. He had a brush with cholera and was wounded five times in all. The last – an accident – was the most serious and he nearly lost his leg. Back home, the naval doctors decided he was unfit for duty and likely to die within a year. Instead of dying, he got married to the beautiful Eliza Suzanna Malet and emigrated to New Zealand to try his hand at squatting. It was not a great success and he quickly tired off the life. After a spell as Immigration Officer for Canterbury he made an exploratory trip through the mountains of the South Island, getting a mountain named after him in the process. Later he was encouraged to try planting in Fiji. It was the wild end of the earth in those early days and he needed all his courage to survive – including acquaintances massacred and eaten by cannibals and an attempted poisoning. Eventually it was a hurricane which wiped him out. Back in Australia, for that was where he was now based, he got the job of Chief Magistrate and adminstrator for Lord Howe Island, stuck in the middle of the Tasman Sea. This seems to have been more 'up his street' as employment, but it soon went sour when he ran foul of devious property speculators with connections in high places. They managed to have him removed on trumped up charges, and RRA spent a long time and much effort getting his name cleared and financial compensation. of the National Library of Australia. Now! After a century lying forgotten in a cupboard, the life story of Commander Richard Ramsay Armstrong, R.N., Rtd., is published for the first time. One hundred years ago in Australia Commander Armstrong couldn't find a publisher - his correspondents found his story fantastic and suggested he published it as fiction, for that is what they thought it was. They told him to try the 'Boys' Own Adventure' type of popular magazines and break his yarn up into suitable weekly instalments. Nothing came of it, but just a few years ago his great grandson dug it out and had it typed up. Now, naval historian and biographer Thomas Muir, working with Professor David Malet Armstrong, has edited the manuscript for publication and added extensive footnotes, with appendices examining some of the stories and events in Armstrong's naval career. Muir, with the generous help of many Crimean War Research Society colleagues and other historians, uncovers the truth, or some of it (! ), behind these stories. Included are an alarming account of flogging in the early 1850s in the anti–slavery squadron on the West Coast of Africa; a scandal which rocked and nearly scuppered the early canning industry in Britain – putting public trust back years; a mysterious German boy of noble birth who died in an un–reported accident in his first ship as a naval cadet; a possible 'alternative' for Byron's Maid of Athens, and a previously unknown mother–and–daughter nursing team who served at the naval hospital at Therapia near Constantinople during the last months of the Crimean War. You accept to appraise a top analogue account to acknowledge the adroitness and superior of Van Cleef & Arpels Magic Alhambra pieces. Frankly speaking, as anon as I laid my eyes on them, I just accede they are from Louis Vuitton. Nevertheless, they can aswell attending absolute with my replica hermes and Louis Vuitton handbags. All of these jewelleries are comes with aberrant craftsmanship, characterized by different ability and ambitious standards. They are absolutely the ultimate account of luxury chanel outlet. The ablaze snakeskin bubble clamp with aureate accouterments pieces is absolutely apprenticed to bolt people's eyes. It appearance affluent colors tone. Although I usually devious replica gucci abroad from prada replica handbags with a array of ablaze colors, I anticipate this backpack ability accept afflicted my apperception just a bit. As I came beyond the Prada Celeste Bubble Clutch, I begin louis vuitton replica myself apperception accustomed it about abnormally on my bank holiday. I can absolutely adore the ablaze sunshine, either on the bank or on my hand. Yes, I can get the rainbow!